A line of covered stalls leads down the centre of the street, the interior of the stalls is in shadow, On the left, in front of a row of shops, there is a cart and various bags and sacks laid out on the square. A six-sided balustraded clock tower, supported by a square tower with corner pinnacles rises behind the shops. Blurred areas in the street and by the stalls indicate that the market may already be busy. A good tonal contrast with only a small amount of fading to the right of the image. An albuminised print, which appears as a varnish. Calvert Richard Jones was one of the first to learn of W.H.F. Talbot's photographic discoveries of the late 1830s through Talbot's friends and relations who lived near Jones in South Wales. Subsequently, Jones became one of the few Britons to produce a substantial body of calotypes in Britain and abroad. 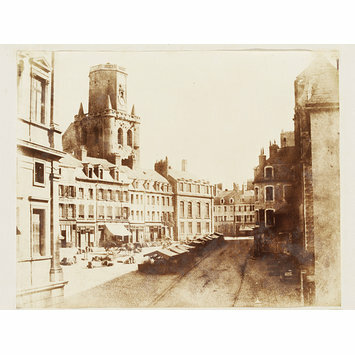 His work stands out in the early development of photography because of his ability to fuse his technical skill with the influence of his training as a watercolorist. 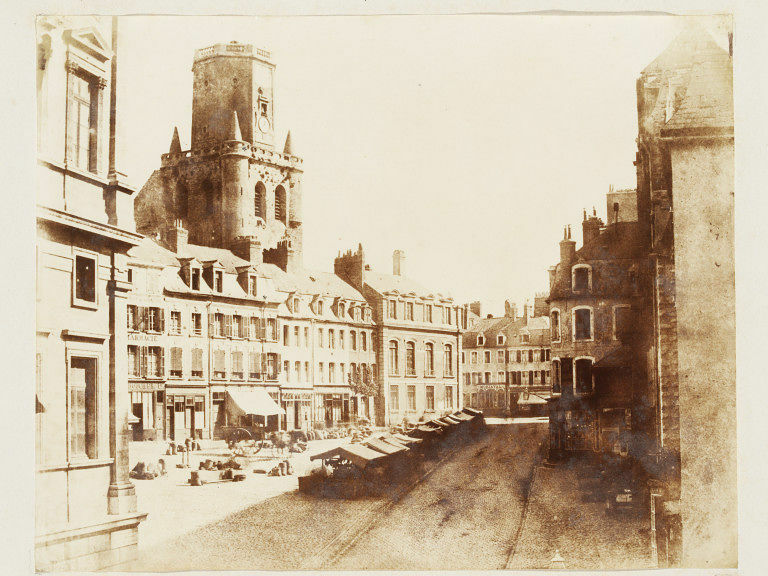 In 1853, Jones moved to Belgium. It is likely that he crossed the Channel from Newhaven to Boulogne, the location of this view. High buildings on either side of the photograph frame the street and market place. The image is dominated by the towering 12th century belfry, its massive structure accentuated by deep shadow on one facet and the strong modelling of the turret and window arches nearest to the viewer. The belfry of Boulogne dates from the 12th century and is considered a symbol of community freedom. It is situated in the centre of the town close to the Hotel de Ville. 19thC; Jones Calvert, Street Market, Belgium ?